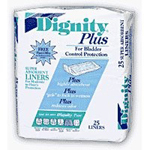 Dignity ThinSerts pads offer remarkable absorbency and retention of fluid, even under pressure. Advances in technology allow a greater quantity of polymer, the material that gels when wet, to be encapsulated in the product. 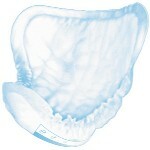 The result is a very thin, but strong pad which provides the optimal combination of comfort, dryness and absorbency. 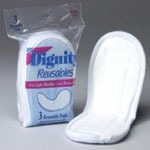 The moisture proof barrier placed within the pad gives an outer cloth like feel. 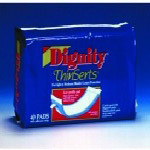 Dignity ThinSerts are discreet, easy to use, economical, and comfortable. They have no rustling sounds, and are undetectable under clothing. "TENA for MEN guards are designed for males with light urinary incontinence. Because these pads have a special odor controlling properties, they will help you stay active and involved."